Being 33… Still working for others with only a faint idea of what to do to earn a living for myself doing what I LOVE, while trying to figure out what makes me tick and still enjoy the moments life has to offer can be exhausting. At least I have chosen to try to figure out how to make this path less tiring, while sending out seeds of intentions to have this universe show up with what I want in hand, and a lot of money to-boot! I spent my life knowing I was different from the herd, knowing that other’s had an opportunity to coast smoothly over even waters while I swam with out floaters in a choppy sea of sharks. Simply put, this world wasn’t designed for me, or other’s like me, it has been designed for the masses. So, if your like me and your not a part of “the Masses” then you know what it’l like to live on the outskirts of this world and peer in praying to find peace with in, because the literal world has no intention of delivering that peace on a silver platter. I am extremely sensitive, to the point where some call it old soul syndrome, some call me A Highly Sensitive, other’ think I am just dramatic. What I can tell you is that if I were to be a drone and walk through this world working at some 9-5 office job, sitting under fluorescent lights and not following my heart, mI would be dead already, literally. But body, mind and soul does not allow me to ignore my heart, and it will certainly not allow me to work souly for money, and not work towards my true souls goal in this life. What does that mean? I get sick, like really sick when I do what is not my true souls goal. The kind of sickness that is incurable by doctors, and only curable by changing my life pattern and getting back on track. When I was in school, there were about 25 students to the classroom. I was so sensitive to sounds and all the other stimulation by the other kids that I could not absorb one lesson taught to me, I couldn’t see the chalkboard through the constant anxiety attacks, and my mom spent countless hours trying to find me shirts that didn’t show my sweat stains in them so I would be less embarrassed at school. I also felt things much deeper and harder then other’s, if I was sad, it felt like my bones were breaking. If I was scared I couldn’t breathe and the remnants would last with me for days. That went for others as well, if a friend was sad or going through a rough patch, I felt everything she would feel and go along for the ride, with out knowing I was an empath and that I could choose to send those feelings out of me. Needless to say, I did horrible in high school, drugs were my only numbing agent savior and even worse in college. What I truly believed in wasn’t valued, and what I loved wasn’t taught because everyone told me it wouldn’t earn me a living so why bother. Five colleges, and Five drop outs later, I was left to bartend and waitress on drugs numbing myself to the life around me that I hated not knowing what the hell I could do do not just fit in, but earn a living for myself and be happy one day, like everyone else seemed to do so easily. 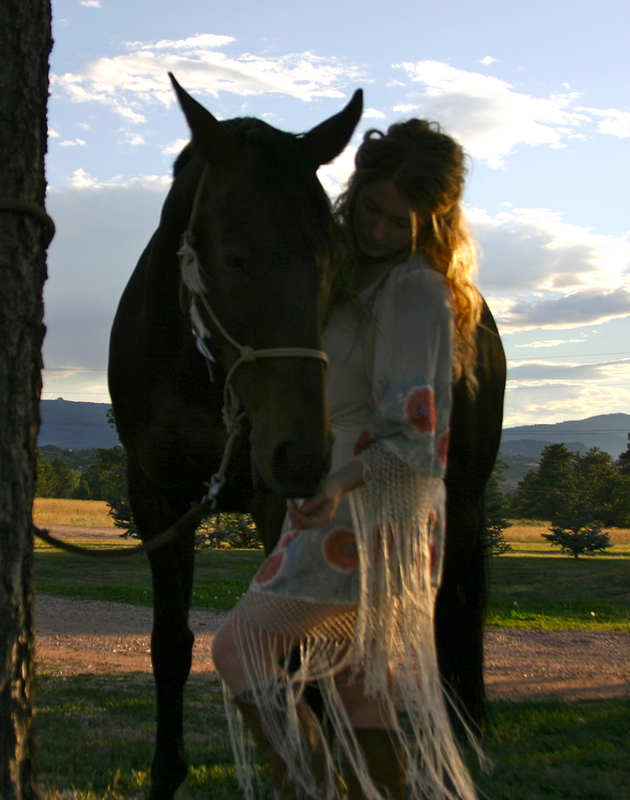 The only thing I had, inside of me that I knew could lead me to peace was my love of horses. I started riding when I was 5, and on top of those 2,000 pound beasts I finally felt like I was with my own kind, like they understood me in every way. They were quiet and loved my sensitivities, as I used them to sense what the horses needed and wanted, they felt heard and I felt loved. It was an unconditional love to, I didn’t have to do anything or say anything to earn their love, I just had to be in their presence and be myself, for the first time I knew what it would be like to feel peace in my life, and it was going to have to somehow be next to these wild creatures. 28 years later, I spent years going to different barns, interview after interview, I even drove across the entire USA praying to find a job working with horses, but the opening never happened. Either the job paid to little to survive on, or it was the wrong employer, as many horse people tend to lean towards the crazy side. I finally realized, that horses were money spenders not money makers, and the people that got to live with horses got that gift because they were independently wealthy, something I am not. So I studies healing, massage, chinese medicine, native medicines, herbology, accupressure, shaitsu, hydrotherapy, aromatherapy, health, nutrition, detox and reiki. After obtaining all of these certifications, I fell in love with the healing arts, but i felt like I was still missing a huge part of my gateway to happiness, horses. Until I crossed paths with a program called EponaQuest. I took a workshop with Tara Coyote, a beautiful woman who found EponaQuest during a rough patch and the teachings led her into the light and also delivered her out of the light with a new business she could run, while still following her heart. The teachings from this program feel like they were written for me, they are taught in small, and I mean small groups. There are four people in my workshop right now and due to the low number of participants, I feel safe and ready to absorb the information rather then get lost in the feeling of over stimulation like I used to in school. We work with horse archetypes, something I have been unknowingly doing for years and we discover deeper meanings with in ourselves. After just one day of Tara’s workshop, “Riding into the unknown, Embracing change and Creating transformation” I already know more about my ways and why I am the way I am, then I knew after 33 years of life moving to many different spiritual centers studying with many different monks. We study emotions, triggers, questions we can ask ourself so that we may discover deeper layers that push us to react rather then just be. We played with the energy field of horses today in the round pen, I discovered where their field began and where mine began as well. I get shy and back away from people with too aggressive of energy just like they do and some how just knowing that there are other beings just like me makes it a little easier to be me. To live inside a body that feels things deeper then most, that hears things others don’t and that see’s things others are blind too. My world is exponentially different then the masses, and all I have ever wanted was to feel like I have a tribe I can roll with. To feel like I can dance through this world with out being pushed to the outskirts but rather be thanked for my uniqueness. I don’t make fun of people for being able to put up with jobs they hate, or be in crowded spaces, or allow people to crash into their energy field, but somehow others feel the responsibility to constantly remind me of how dramatic or overly sensitive I am. So I just want to say this, all of us humans want the same thing. We all want to be loved, we all want to be able to feel a sense of freedom to follow what we love and none of us wants to be put down. Knowing that I have just found my herd, and this herd is the beginning of a spark that may lead to the loving fire of my future lights me up inside like none other. I may not know what to do for a career, but I do know for sure it starts with these workshops, and at the end of the training I will use the teachings to help others. I will get my certification to lead EponaQuest workshops for myself and help other’s know what it’s like to be loved unconditionally, and no matter what your ‘drawbacks’ may seem to be, there is always a path to overcome them. So many thanks of gratitude to Linda Kohanov for beginning EponaQuest, and much gratitude for Tara Coyote of Wind Horse Sanctuary in Nevada City, CA. for supporting and teaching me, I am forever changed for the better and I light up once more for my life ahead! Oh yes….And thank you to all my four legged horse friends and teachers, I will love you forever, I’ll adore you for always, and as long as I’m living, my teacher you’ll be! Scarlett, what a beautiful and inspirational blog post this was. You are truly a bright spirit and I’m so happy you found this path and our journeys have crossed.